When it comes to landscape features, a water feature can be one of the most arresting sights in landscape, but also the most difficult to install. Not only does it require many specialties to come together – landscaping, hardscaping, excavation, plumbing, electronics, and pumping – but its long-term success depends on many factors. 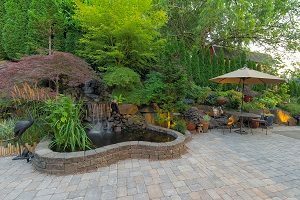 This article will work as a starting point for a dialogue with a landscaper, narrowing down your ideal water feature and what obstacles you will have to overcome. Your first focus should be on the type of feature you want on your landscape. Your options of each and overall vary depending on several factors, including space, budget, and personal preferences. Here are the three general categories. Self-contained water features, these tend to either be below-ground as ponds or above ground in a hardscaped fountain or basin. Ponds can vary in size and functions, from a shallow reflecting pond to a much deeper pond for fish. They tend to include water circulation, either with an in-water pump, or a more elaborate feature such as waterfalls or flowing streams. The sound of flowing water can be as soothing to both sight and hearing. Waterfalls will require some verticality in the landscape, either standing or built into a mound or hill. Streams require some horizontal distance and often are deeply incorporated into the landscape. Both can be combined with a pond for additional beauty. The most utilitarian of the three, pools often require massive excavation and specialized products to install. Specialists mean that usually, several contracting companies must work together to dig, stabilize, plumb, and fill the pond, with additional hardscaping to complete the project and bring it into your exterior living space. From small ponds to massive pools, before any digging can begin, the area needs to be cleared for excavation. For Massachusetts, it’s the Dig Safe law, though every state has similar rules. These rules (and the fines that enforce them) are designed to coordinate between property owners and utility companies to avoid water, sewage, electric, gas, and fiber optic lines being damaged or disrupted during the digging process, something no one wants. If you did yourself, you need to call 811 at least 72 hours in advance. If you’re working with contractors, it’s their responsibility instead. A few more factors to consider when planning out a water feature. If any of these are true for you, make sure to consult your contractor about it. Children and Pets: Make sure your water feature is safe for your children and pets. Even think about incorporating separate water features for them. Wildlife: If you’re looking at stocking a pond with fish, make sure to take local wildlife like raccoons into account on design. Ground Prep: Getting soil samples done as part of the consultation process can help you learn about any potential difficulty. Winter Conditions: What are the winters like in your region? Make sure you have the tool in place to winter-proof your water features, such as keeping fish ponds alive. If you’re interested in landscaping a water feature into your backyard or business, contact the landscaping experts at Greener Horizon. We can help you design the perfect landscape for your budget and square-footage.